The whine of chain saws fills Henry Cowell Redwoods State Park, located just a few miles north of Santa Cruz, Calif., a beach town best known for its surfing. From atop the wooden observation deck, perched on the rare and unique Santa Cruz sandhills -- an area of the park that 10 million years ago was part of the Pacific Ocean -- two dozen California Conservation Corps (CCC) members wearing brightly colored hard hats can be seen hacking away at everything green down in the forest below. "This type of flora and fauna is fire-dependent -- this sandhill chaparral habitat needs bare sand," said Tim Reilly, an environmental scientist with the Santa Cruz district of the California Department of Parks and Recreation. "It's a very rare habitat -- probably the most rare in California -- and it's a challenge to know what type of fire we need to use to manage it." A field team from California's Conservation Corps ponders what to cut next. Photo by Brittany Patterson. If left unattended, about once every 85 years, a natural fire cycle would restore the Santa Cruz sandhills to its sandy, ideal state. But as protected public lands, the area is now under the jurisdiction of the California Department of Parks and Recreation and California Department of Forestry and Fire Protection, or Cal Fire. Due to a lack of manpower, the agencies had been taking a mostly hands-off approach. "We have a huge fuel load here," Reilly said, gesturing around him at the Douglas firs and oak trees rising out of the brush-covered landscape. "Looking around it made us nervous." In 2010, the agencies collaborated to begin doing prescriptive burns, or controlled burns, for 50 acres of the sandhills. Five years later, they've only managed to clear 20. For the next three months, Parks and Recreation and Cal Fire will have the manpower available to them to work on this project and many more in the region's forests, thanks to Gov. Jerry Brown's (D) March 2014 emergency drought relief funding package that allocated $687.4 million to communities facing water, food and housing assistance. Part of that money was given to the CCC. 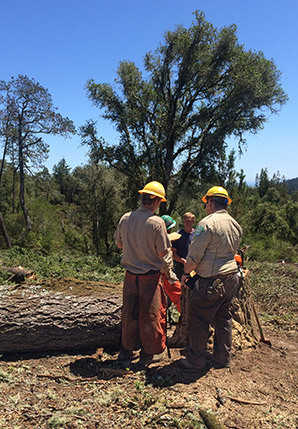 "This freed up money to perform fire fuel reduction work," said Chad Harris, a CCC crew leader and supervisor of the Big Basin Redwoods State Park tent camp located a few miles away that is providing the CCC manpower. Established in 1976 by Brown during his first term in office, the CCC is a state agency that hires young Californians between the ages of 18 and 25 to do natural resource work on public lands, such as plant trees, construct trails, install fences, and respond to natural disasters like fires and floods. The emergency drought funding, which the CCC will have access to through June 2016, has allowed the state agency to create a six-month, 36-member residential tent camp crew dedicated to fire fuel debris reduction. Big Basin is the tent camp's third location. Previously, the camp was set up at Silverwood Lake in San Bernardino County and then Lake Camanche in Calaveras County. The long-term housing situation not only allows CCC members to live near the area they're tasked with working on, but also gives partner agencies ample time to use the crews for big projects. "It helps to jump-start what we can do," said Martha Diepenbrock, director of external affairs for the CCC. "For our partners, these are funded resources that can be applied to high-priority projects." Drought funding has also paid for an additional five crews across the state that are dedicated to water conservation projects on both public and private lands. Corps are trained to do things like turf removal, replace outdoor irrigation systems, and install items like low-flow toilets and water fixtures. The idea behind the fire hazard reduction camps is to prevent future fires from raging out of control. "We can reduce the fire load to keep fires local if they do break out or prevent them from taking an entire hillside," Harris said. "We can help keep the land accessible for fire vehicles, as well." Reducing the fire load is especially important in California, where record drought has created tinderbox conditions in the state's public and private lands alike. Across the state, forest officials recently reported that at least 12 million drought-weakened trees have died, mostly in the southern and central parts of the state, but tree death seems to be spreading north as the drought lingers. Climate change poses increasing challenges to forests in the Golden State, including a forecast increase in the number of fires, insects and disease. Furthermore, a study out last week finds wildfires are occurring more often at higher elevations in the Sierra Nevada, being driven by both climate change and some forest management practices. According to Cal Fire, some of the best adaptation strategies include forest thinning and fuels reduction in order to make forests more resistant to wildfires and to reestablish ecosystem resilience to natural cycles of fire and other events. Park Ranger Emily Bertram, who is stationed at Big Basin Redwoods State Park, said the drought has taken a toll on the state's oldest state park, which contains 10,800 acres of old-growth forest and is home to the largest contiguous population of ancient coastal redwoods south of San Francisco. "We've seen record numbers of trees falling down, unassociated with any weather event," Bertram said. "We think it's from generalized stress because of the drought. We're a tinderbox." Big Basin hasn't been touched by wildfire, but in 2008, then-Gov. Arnold Schwarzenegger (R) declared a state of emergency for Santa Cruz County when the Summit fire burned 4,270 acres, resulting in the evacuation of 1,400 homes and costing taxpayers more than $16 million. In May 2014, a wildfire scorched a building and 5 acres near Mount Madonna before two helicopters were able to put it out. But as conditions continue to deteriorate because of the record drought, fire is a persistent fear in Santa Cruz and beyond. As of yesterday, nine wildfires were blazing in California, according to Cal Fire, including the 6,900-acre Wragg fire, which broke out near Lake Berryessa in Napa and Solano counties and has destroyed one structure and is threatening 150 more. On Saturday, the Lowell fire broke out in Nevada County and has burned 1,700 acres and is 20 percent contained. According to the National Interagency Fire Center's summer wildfire potential outlook issued July 1, in Northern California, long-term drought conditions are "likely to lead to a condition where above normal fire activity is possible, even though the forecasted weather conditions indicate a continued somewhat frequent moisture input." "Throughout the park, vegetation grows and it's a constant struggle to have enough resources," said Chris Spohrer, Santa Cruz District services manager for the California Department of Parks and Recreation. "This is a focused group of skilled labor that can provide fire safety where really it's been needed for the last 10 years." For Secretary of the California Natural Resources Agency John Laird, the use of CCC to do fire load reduction work with the help and blessing of both the Department of Parks and Recreation as well as Cal Fire is an example of state agency collaboration at its finest. "I know I'm supposed to love all my children equally," he said, laughing, "but I'm glad to see them getting along." For the corps members, who will be stationed at the tent camp in Big Basin until mid-October, working 10-hour days clearing parts of Henry Cowell Redwoods State Park -- but also helping the parks department with a dozen other projects -- it's a way to receive job training, as well as make some money. Brian Hougland, a 28-year-old CCC member, seemed cheerful, despite being covered in a layer of sweat and dirt. Standing in the midday sun, Hougland said the crew uses "anything to get the job done," including but not limited to axes, chain saws, rakes and pitchforks. Currently, the CCC crew is clearing 10 acres of forestland to about knee height so that it can be burned in a controlled manner. A California resident since 2000, Hougland said he feels like the CCC's work was crucially important in trying to temper the effects of the wildfire season California is certain to experience. And the drought, he said, isn't helping. "The drought turns everything into kindling -- even the trees that look healthy and green on the outside, they're dry inside," he said. "I like to say we're being the bodyguards for the forest."